This Mutton Stew with Minted Dumplings is slow cooked to turn the meat into the most flavoursome yet tender meat ever. If you’ve never tried mutton before, please do give this recipe a go, it’s fabulous! Oh yeah! This dish is a little beauty, and brings all the best elements of a good stew together. Not only do you have the softest, tenderest meat drenched in a rich red wine based gravy, you have these little dumplings which are flavoured with fresh mint leaves and complement the mutton a treat. I’m assuming that any good butcher will be able to source mutton for you if you ask them nicely And if they can’t source mutton but can sell you hogget, then that’ll do just fine (if you’re wondering what the difference is: lamb is from a sheep up to the age of one, hogget is a sheep aged between one and two, and mutton is a sheep older than two). You have to cook mutton and hogget slower than lamb otherwise it’ll be tough as old boots, but as always, this is where the slow cooker becomes your best friend. It excels at turning the tough and inedible into the most unctuous and delicious of meaty treats. Brown the meat in a hot pan in batches and pop in the slow cooker. Add in the carrots, onions, garlic and red wine. Flatten the ingredients in the slow cooker with a spoon, boil a kettle and top up the slow cooker until just below the top of the meat/veg. Cook the stew for around 4 hours of high, or 8 hours on low. 1 hour before the cooking time is finished add the sprouts and leeks to the stew, Mix the cornflour with a tablespoon or two of cold water and stir into the stew along with a little salt and plenty of black pepper. Pop the lid back on whilst you make the dumplings by mixing the dry ingredients together with the chopped mint leaves and water, and bring it altogether into a pliable dough. Divide into 8 balls and pop onto the top of the stew. Cook on high for another 30 minutes or until the dumplings have expanded and are cooked through. Serve with crusty bread and plenty of butter. We ate a lot of mutton when we were in the Caribbean, and I always enjoyed it. With minted dumplings sounds lovely too! 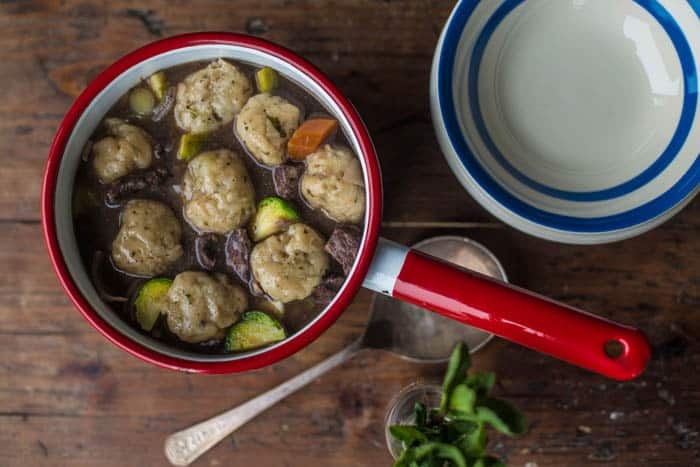 This looks absolutely amazing, I love finding new slow cooker recipes and dumplings are such a childhood comfort food for me, I can’t wait to try this minted version! I do love mutton and dumplings flavoured with mint are the perfect way to enjoy a stew as good as this!